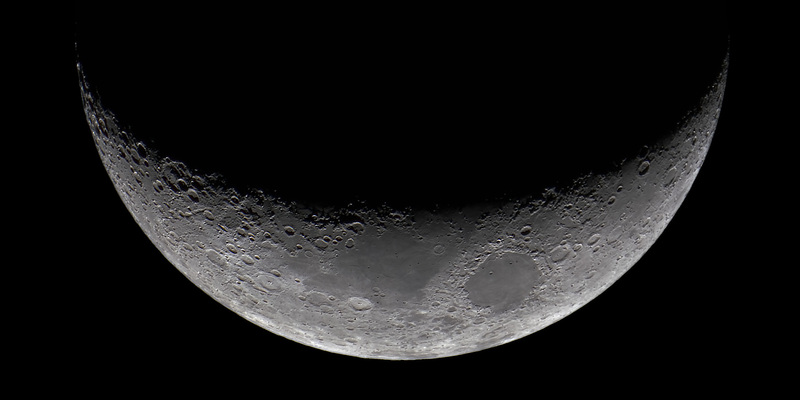 Horns pointing roughly to the side with the lunar axis of rotation aligned vertically - This view makes it easy to overlay features on the Moon from different shots, irrespective of phase or lunar libration. It is also the view humans have of the Moon relative to the horizon near the earth's poles. 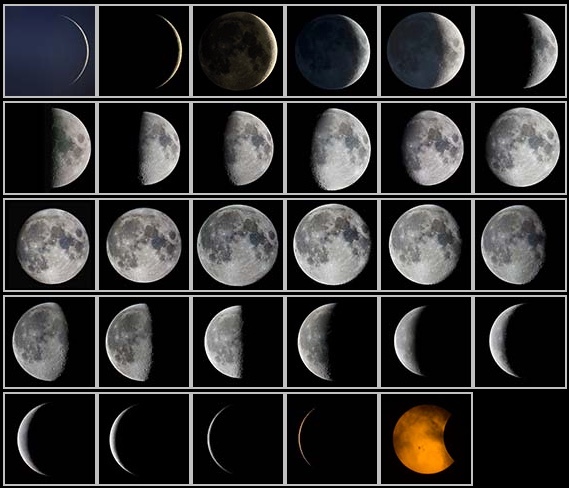 Horns pointing exactly to the side with the terminator vertically aligned - This horizontally symmetric view is what we are used to seeing in "phases of the Moon" charts. Horns pointing up and to the side - This view reflects the normal human horizon referenced view of the Moon. The horns of a crescent Moon always point away from the sun. 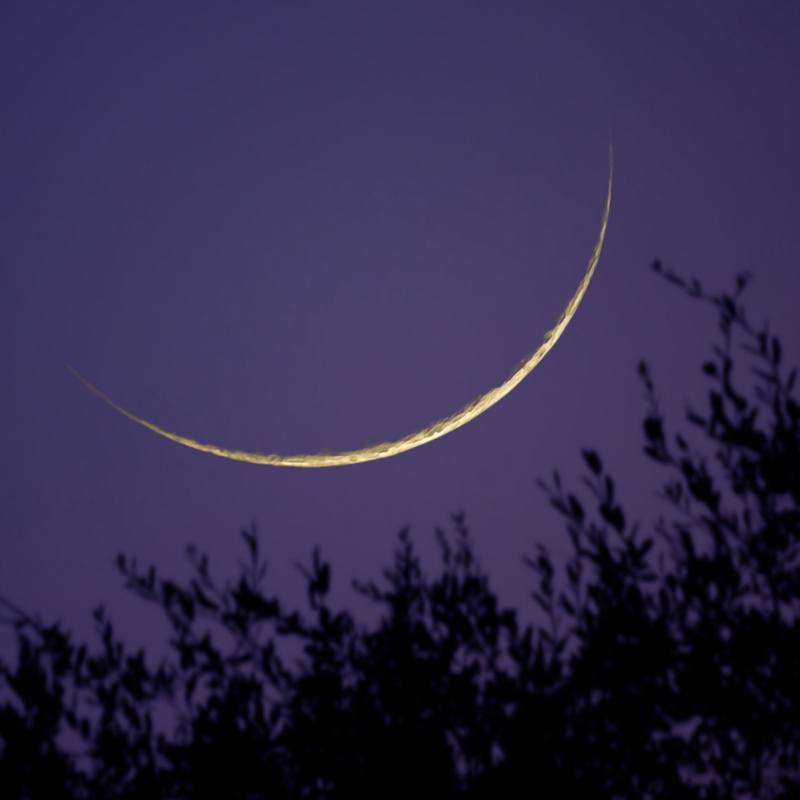 The crescent Moon is visible before (waning crescent) sunrise or after (waxing) sunset. The tilted horns of the crescent will point up and toward the equator from the horizon in equatorial and mid-attitude regions of the earth. The tilted view appears slightly off balance and suggests motion and the relatively brief period of time that crescent moons are visible in the sky. Spicewood Golf Course, Austin, Texas, 2015-09-14 8:25 PM CDT. Last night’s low humidity was a great chance to capture a sharp image of a day and a half old crescent Moon - only 2.7% illuminated. I took frames of the Moon sinking behind the tree and then after it was out of sight I got better focused and exposed shots of the tree. I liked this image with my best Moon frame, but the overnight 8 parameter affine stacking gives the sharpest crescent Moon image that I’ve been able to take. Questar 3.5 with Sony NEX-5N at prime focus. Moon exposure 0.5 sec and trees 1.3 sec at ISO 800. 33 Moon frames stacked with 8 parameter affine transforms in Nebulosity, deconvolved in Lynkeos, stacked with in focus tree image and final tweaks in Photoshop. Horns pointing exactly up - This view of the moon is less common occurring near when an equinox and an eclipse are close with the moon right above the sun at twilight. By placing the horns at the top, it presents a more aggressive or masculine connotation. In my "Longhorn Moon" image below I'm making reference to the University of Texas team mascot. If I lived somewhere else I might have called it a bull or water buffalo Moon. Horns pointing in an downward direction - this view is the most unusual because it doesn't occur naturally with a horizon reference. If used in context with other horizon referenced elements, this view could suggest discord or suggest the unnatural. Without those elements, it can give very different connotations. The view below gives a pleasing organic or feminine profile. 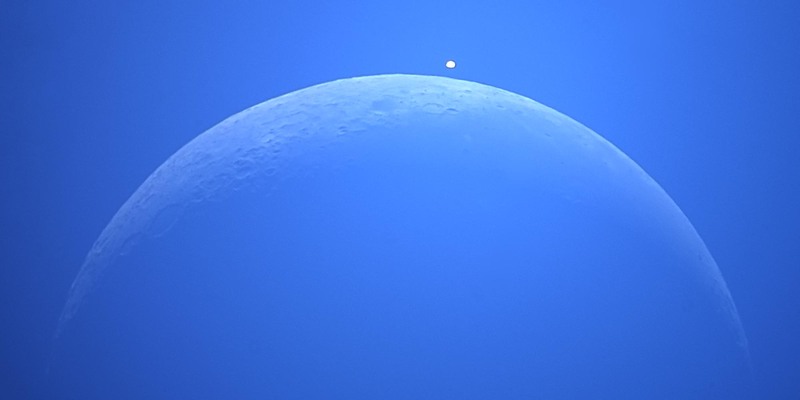 In the image below of a lunar occultation of Venus, it was chosen for that reason. Left to right reversals of the all of these views also occur. The most common reason is that some telescopes naturally present a reversed view of the image.